The River Raisin is a river in southeastern Michigan, at flows through glacial sediments into Lake Erie. The area today is an agricultural and industrial center of Michigan. 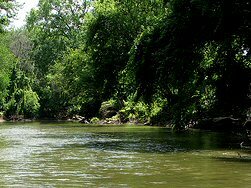 The river was named by French explorers who noted the wild grapes growing along its banks, since the French word for grape is raisin. During the winter of 1813 as part of the War of 1812, a battle occurred near the river between British and Native American troops under the command of British General Henry Proctor and Native American chief Tecumseh, and a small division of Kentucky militia under command of General James Winchester. Greatly outnumbered and facing total slaughter, Winchester surrendered with British assurances of safety of the prisoners, but in a few days they were massacred and scalped by the Native Americans without British intervention. The massacre was only ended by the return to the area of Tecumseh, who had been away. He then proceeded to admonish the British officers for allowing such behavior. The Massacre of the River Raisin became a rallying cry "Remember the Raisin" particularly for Kentuckians, and American troops returned in the spring to drive the British from Michigan forever. The original battlefield is now a park in Monroe, Michigan and has a monument to the Kentucky soldiers who died there.